In the days when King Camp Gillette was a travelling salesman, he thought hard about this statement – made by the man who invented the disposable bottle cap. “I was a dreamer,” he said ‘who believed in the ‘gold at the foot of the rainbow’ promise.” He was forty when the great idea came to him one morning, while he was shaving. A razor with a cheap disposable blade! Men shaved with a razor and blade all in one, and the blade had to be resharpened whenever it got blunt. That was quite often, for each time the average man shaves, he slices off approximately twenty-five thousand bristles – the equivalent of seven yards. Why not invent a razor blade so cheap that it could be fastened into a special holder and, when no longer sharp, could simply be thrown away and replaced by a new one? “I rushed out” said Gillette, “and bought some pieces of brass, some steel ribbon used for clock springs, a small hand vice and some files.” With these he built the first rough model. That was in 1895. Gillette had the idea, now he had to develop it. For the next 6 years he struggled with ways of making a cheap, wafer-thin blade. He needed very thin, very strong steel. But he had no technical training; steel experts thought the whole idea was impossible, and friends laughed at him. Then, luckily, he met an ingenious inventor galled William Nickerson, who agreed to work on the mechanical problems. Nickerson had already invented such things as the push-button mechanism which stops a lift at a certain floor, and machinery for automatically weighing and packing cereals. The first Gillette Safety Razor company was started in 1901, above a fish shop by the Boston wharves. William Nickerson solved all the design problems, and, just as important, invented special machinery to make the razors and blades automatically. But the company was in dreadful difficulties: it owed money, and no one would buy the razors. Gillette and Nickerson gave them away to their friends, and at last one friend recognized what a good idea the invention was and promised financial backing. It was the turning-point. In 1903, 51 razors and 168 blades were produced. Next year (when Gillette got the patent of his design) the total rose to 90,000 razors and 124,000 blades. 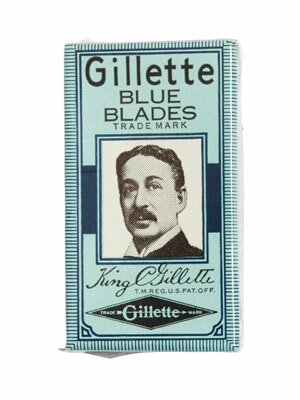 In 1908 just under 300,000 razors and over 13 million blades were sold. By 1909 Gillette had factories in England, France, Germany and Canada and was so successful he retired to California, where he grew fruit-trees and dreamt about reorganizing the world’s economy. His face – with dark wavy hair and neat moustache – continued to appear on the front of every packet of Gillette razor blades until 1963. Men have been shaving their faces for thousands of years. Bronze-age men used bronze razors, which, along with their weapons and jewellery, were often buried with them. The Indians of Central America used a sharp, glassy rock called obsidian. Even pumice stone has been tried, to grind the whiskers down. Through-out history, shaving has been in and out of fashion. Sometimes it was banned for religious reasons. On the other hand, soldiers were often discouraged from growing beards, because a beard gave the enemy far too good a hand-hold in battle! The old cut-throat razor was really rather a dangerous weapon – a sharp, unprotected thin blade – and it had to be used with skill. The first safety razor was invented in 1762 by a Frenchman, Jean-Jacques Perret. He put a guard along one side of the blade. It looked rather like a small rake, and stopped the blade from slipping into the skin. So Gillette didn’t actually invent the safgetty razor but he did significantly imprtove on it. The key difference between the safety razor and the disposable safety razor is the manufacturing of the blade. The original safety razor’s blade was forged and had to be manufactured one at a time. The disposable safety razor’s blade was stamped metal and could be made relatively quickly and on mass. An Englishman, William Henson, invented the modem form of safety razor by setting the blade at right-angles to the handle. But safety razors took a long time to become popular. When Gillette started marketing his safety razor with disposable blades at the beginning of this century, he got involved in a big advertising war with his rivals who made ordinary razors. Barbers were frightened of losing their trade and fought against Gillette’s safe ‘do it yourself’ method. Soon, however, razors with disposable blades were themselves being challenged by an entirely new technique: dry shaving. No soap, no water, no brushes, creams or lotions, just a small machine with a moving cutter rotating or oscillating against a fixed cutter. Hairs pass through the slots of one and are cut off by the other. The first patent for this new technique was taken out by an Englishman, G. P. Appleyard, just before the First World War. 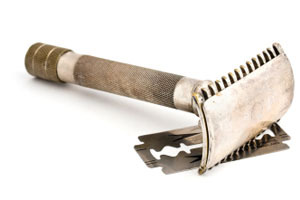 In 1923 Colonel Jacob Schick got a patent for the first electric shaver – the dry-shaving method – using a powerful little motor encased in an insulated handle.